Using the VE.Direct to Bluetooth Low Energy Dongle you can display your BMV or MPPT information on iOS and Android devices, using the VictronConnect app. View information wirelessly such as battery status and solar panel power, plus other useful data. 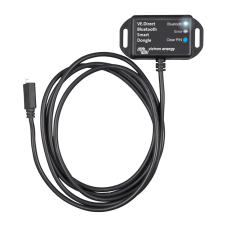 The dongle is able to read data from the BMV-70x series battery monitors and MPPT Solar Charge Controllers (except for the 150/70 and 150/85) using the VE.Direct communication port. The Victron VE.Direct Bluetooth LE dongle uses Bluetooth Low Energy, marketed as Bluetooth Smart which is a technology for the Internet of Things (IoT).